In the art scene, political engagement is not always viewed positively. Commitment to a good cause is sometimes dismissed as "service art" or merely as "well-intentioned". Images arise to get media attention and to be posted. 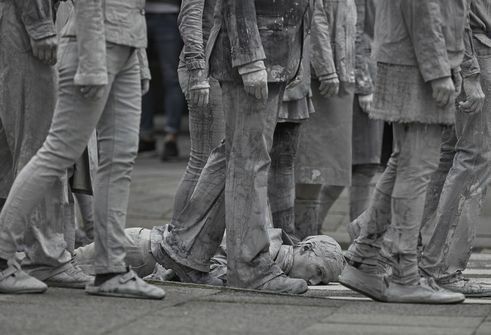 In July 2017, a day before the heads of state and government of the 20 leading industrial and emerging nations were to meet for the G20 summit, 1000 clay-smeared figures shuffled in slow-motion through Hamburg’s old-city district. “The 1000 figures are meant to embody a society that has lost its sense that another world is possible,” states an explanation of the art action on the organisers’ website. With zombie stares they stepped over people who had fallen exhausted by the wayside. Then, after a good 90 minutes, salvation. The grey figures stripped their clothes off, fell in each others’ arms and danced, colourfully and merrily together through the streets. Happy End. 1000 Gestalten | Art Performance at G20 summit in Hamburg | July 2017 | Photo: Andrea Ruester In real life things aren’t quite that simple– although they could be, if only everybody would join in. That is more or less the protest action’s message. Just how badly this works out was to be seen in the days that followed: masked and hooded persons roamed through Hamburg’s streets, stones, firecrackers and bottles flew, tear gas, water cannons and truncheons were deployed, barricades set up, windows smashed and cars set on fire. Many people were injured and there were hundreds of arrests. But at least there were lovely pictures of the “1000 Figures” on Instagram, as one might comment sarcastically, because the group performance was also staged to be Instagrammed. 1000 Likes for protest art. What is art in the age of social media? A Like? Clickbait? Is art being instrumentalised to guarantee attention for its creators? Can art help at all in a political crisis or does it lead to its own self-fulfilling crisis, because art is being confused with actionism? At least one cannot accuse many artists of one thing: that they are apolitical and simply keep out of things. Last year, Turner Award winner Wolfgang Tillmans designed posters with which he warned the British about leaving the EU. He posted his posters online, they can be downloaded, printed and displayed. “What is lost is lost forever”, stood on one of the protest posters. Tillmans’ anti-Brexit campaign also went viral, because James Bond actor Daniel Craig wore one of the motifs as a T-shirt and sent Tillmans a photo, which the latter in turn shared on his Instagram account . Tillmans identifies as an amplifier; social media make his voice even louder while he himself relies on the impact of his arguments and contents. “No man is an island. No country by itself”, is written on a T-shirt of Daniel Craig’s. And below: “Vote Remain”. Just as for the artist there could be only one view about Brexit, there was almost complete agreement with Tillmans’ campaign. Because he acted in a reflective and cool-headed manner and had one goal, the education and mobilisation of the voters. Tillmans’ action is a rarity. No protest without spectacle is how one might sum up recent actions. The ideas artists have come up with have been vehemently discussed, disputed and occasionally sharply condemned. In the forefront: Ai Weiwei and the Zentrum für politische Schönheit (Center for Political Beauty). Too blatant, too opportunistic, too cynical, in short: a scandal – thus the reactions online. The Zentrum für politische Schönheit announced that in Berlin refugees would be eaten by tigers if the law prohibiting carrier firms from transporting persons without entry permits is not abolished. “Our response to #fluechtlingefressen: the action is cynical and performed at the expense of the vulnerable”, twittered the Ministry of the Interior. Escalation for maximum attention. The debates in the art world are controversial: Wolfgang Ullrich is convinced that political action-art is not the better form of protest. He fears that in this way positions will become even more entrenched. In the SZ Kia Vahland places the responsibility in our hands, the artists’ audience: “The makers offer service art, they sell a good conscience like tea bag manufacturers who market their products with printed inspirational sayings.” And in the FAZ Julia Voss responds to the allegation that artists such as Ai Weiwei instrumentalise the refugees’ misery for their own purposes. She writes that art history is full of cases where political engagement led to career setbacks. However one may interpret individual political art actions for oneself, the artists in any event have succeeded in their aim: intensifying the debates on current political problems. Anika Meier, an expert on art and aesthetics and an independent author, lives and works in Hamburg. She is underway on Instagram as @gert_pauly. On her blog "artefakt" she writes about art, literature and internet phenomena. Copyright: Text: Goethe-Institut, Anika Meier. This work is licensed under a Creative Commons Attribution – Share Alike 3.0 Germany license. “Beautiful Politics” The Highest Form of Art?